Plink Garbage Disposer Cleaner and Deodorizer removes buildup to unclog disposals, and to freshen the entire kitchen with a pleasant, fresh scent. Refresh your kitchen with the Plink Garbage Disposer Cleaner and Deodorizer. Specially designed by plumbers to be powerful and effective, Plink cleans, deodorizes and unclogs garbage disposals by removing buildup and breaking up fats and food particles that cause clog. The built-in odor eliminator quickly washes away foul smells and freshens the entire kitchen with the clean, fresh scents of lemon, orange or lavender. Go ahead and Plink the sink disposal twice a week to maintain a clean garbage disposal and prevent future clogs. It’s non-toxic and biodegradable, safe for the environment, and safe for plumbing and the septic tank, too. Easy to use, simply drop Plink in and run the sink garbage disposal with a slow stream of water for 15 seconds. Voila! No more clogged garbage disposal. Revive fresh scents by running the garbage disposer with bursts of hot water. Includes 20 Plink balls in assorted scents of lemon, orange and lavender. 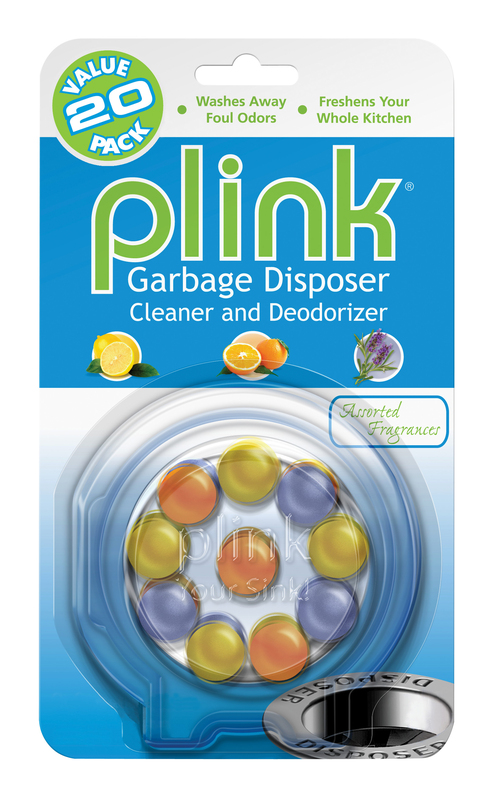 The Plink Garbage Disposer Cleaner and Deodorizer, comes in a Value Pack of 20, in assorted scents of lemon, orange and lavender. This entry was posted in Useful Tools on April 15, 2015 by HIC, Harold Import Co..